Can You Find The Lions And UM Moments In This Football Poster? 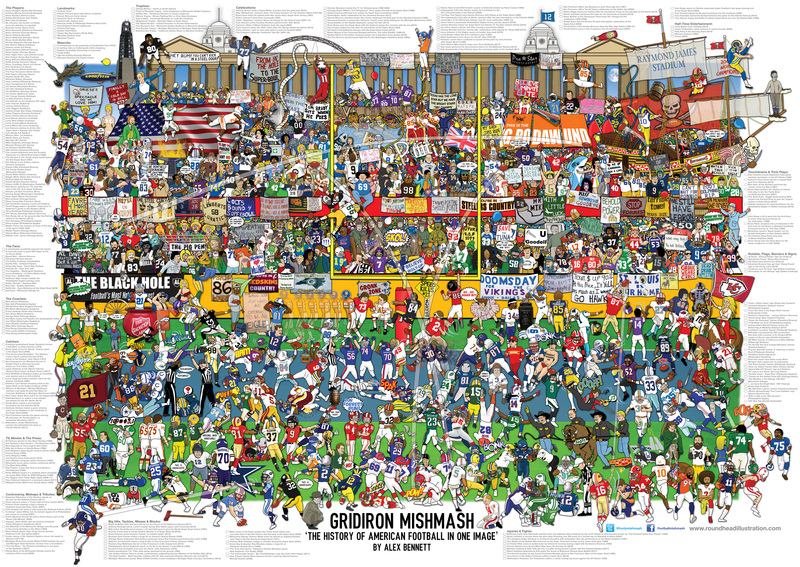 Illustrator Alex Bennett has delivered a giant tribute poster of iconic American football moments called 'Football Mishmash'. Both the Detroit Lions and the Michigan Wolverines have several highlights (and lowlights) featured. Can you find them all? The full size poster is found here. Blake O'Neill fumbling the punt attempt against MSU. Charles Woodson striking his famous 'Heisman' pose. Michael Westbrook's Miracle catch over Ty Law in the Big House to give Colorado an upset win in 1994. Joe Schmidt tackling John Henry Johnson of the 49ers for a loss in their big 1957 comeback. Calvin 'Megatron' Johnson striking his famous muscle pose. Barry Sanders scampering for yardage. Mike Utley giving his famous 'thumbs up' to the fans on his return to the Silverdome from his paralyzing injury. And I believe this may be 'Night Train' Lane of the Lions, but I couldn't find a listing for him in the massive index that surrounds the artwork. If you're any kind of football fan, you'll love just scanning the massive drawing and trying to identify all the famous moments featured on it. I spent hours perusing it recently, and didn't regret a minute. It was fun.